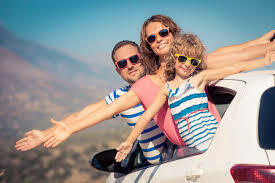 Traveling with your family in a car can be an enjoyable experience. However, avoiding stressful situations like motion sickness and quarrelsome kids can make your trip a whole lot more fun. Here are some family car travel tips that will make a big difference. Plan Ahead – Know how long a trip your kids can handle. For example a 10 hour car ride may not work for your 4 year old. It is best to keep car rides to a maximum of 6 hours if you have young children. To make the ride comfortable you should consider a van for long road trips. Packing – Start your packing at least 3 days prior to the trip. Get your child to help you with the packing of his/her items. This will get your child excited about the journey and help him/her understand what to expect. What to bring – Make sure your kids are safe with a well secured car seat. You should also include a first aid kit with child friendly medication. A Portable DVD player is also a good idea as it will keep you child entertained for a few hours. You could also include puzzles, colouring books and crayons. Pack a few snacks that your child enjoys and plenty of water. It is a good idea to pack a blanket and pillows in case your child decides to take a nap. To keep your vehicle clean include wipes and a trash bag.